What is SKIN REJUVENATION ADVANCED (SRA)? SRA Treatment, also known as Intense Pulsed light, Fotofacial or Photofacial is a secret weapon for reversing many skin pigmentation issues and can also greatly benefit people struggling with acne. 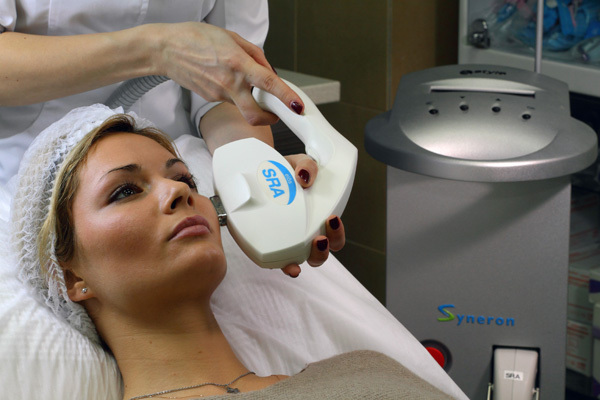 Luckily, these symptoms of aging can be treated easily with our Syneron SRA IPL laser. The name IPL stands for Intense Pulsed Light which is a broadband beam of light, unlike laser which is a single beam of light. What is SRA used for? SRA skin rejuvenation successfully treats uneven skin tone, freckles, brown and red spots, broken blood vessels, spider veins, birth marks, as well as discoloration and fine wrinkles caused by sun damage. It is also a valuable tool to help clear up bacteria caused by acne and helps to correct acne prone skin. What does SRA literally do? Our SRA (SKIN REJUVENATION ADVANCED) laser uses a unique combination of radio-frequency and intense pulsed light to isolate the treatment area and leave the surrounding skin free from potentially harmful side effects. Using gentle pulses of two targeted energies means better results with lower overall energy output — assuring the highest level of safety and comfort. The laser is attracted to the dark pigmentation of brown discoloration on the skin – and draws it towards the surface of the skin — and eventually out altogether. When treating redness the laser setting is attracted to the hemoglobin and heats up the tiny vessels to the point where they collapse and the blood retreats. This provides a clearer, smoother complexion which will smooth out your skin tone and improve texture. After a treatment with the SRA for pigmentation – the brown spots will become darker, sometimes taking on the look of coffee grounds. The laser works by drawing these pigments to the surface, which is why they will be more prominent after treatment. This is a sign the treatment is working. Resolution of these darkened areas may take up to 10 days to disappear completely. Most patients will require 2-4 treatments, 3-4 weeks apart. Depending on the sun damaged area, several additional treatments might be necessary. Individual experience varies, but most people only feel a slight sensation like tiny pin pricks, or rubber band snaps. For your added safety and peace of mind, we utilize a cooling technique to ensure maximum comfort for our patients. Many of our patients can easily return to work afterwards. You may experience some slight redness post-treatment but this will dissipate as the day goes on; it is easily covered with makeup if you are prone to flushing. After treating redness or blood vessels, the skin can be slightly pink and some larger vessels may turn dark red or black for a few days and this heals much like a scratch would in just a few days to a few weeks based on your body’s unique healing process. What can I do to reduce the side effects of treatment? If you are not cautious about protecting yourself from the summer's sun, then SRA treatments are not suited for you during the summer months. We want to ensure that you receive the best outcome from treatment and receiving treatment on any area exposed to the sun in summer months is counter-productive to treatment. With that being said, avoid sun exposure 4-6 weeks prior to SRA treatment. This is true of sunless tanning (spray tanning or tanning lotions) as well. We recommend avoiding tanning beds as well as sunless tanning creams prior to a treatment. What does the SRA treatment cost? Cost for treatment varies considerably based on the individual and his/her unique goals and desires. We endeavor to provide you the best combined value of cost and exceptional patient care at A Spa Above.